French onion soup is an easy and comforting soup to make at home. The downside to making this rich and flavorful soup the traditional way is that it can take quite a while to make. Instant Pot French Onion Soup changes all that by caramelizing the onions in just half an hour, instead of the usual two or three hours when done on the stove top. This results in a comforting, rich, and hearty soup ready in just under an hour. 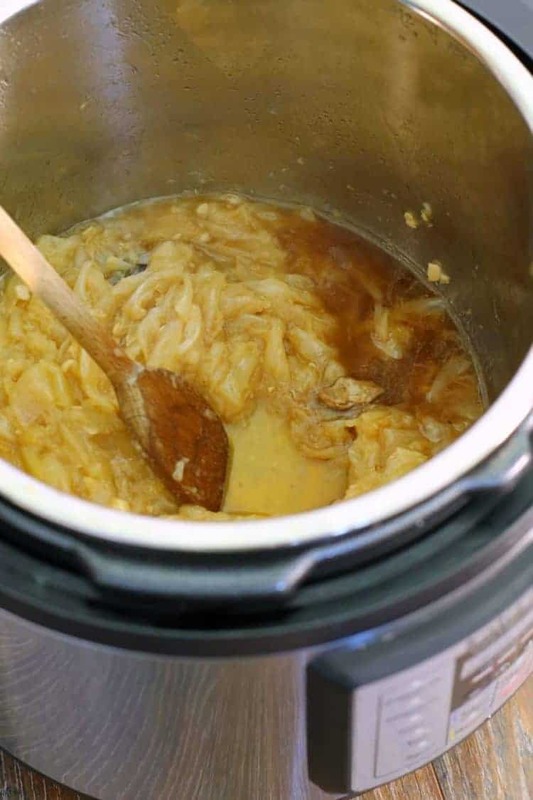 Can You Caramelize Onions In A Pressure Cooker? Due to the amount of time needed to properly caramelize onions on the stove top, french onion soup is not a recipe I would normally make during the week. This all changed though with the appearance of the Instant Pot in my kitchen. By cooking sliced onions in a pressure cooker, (in this case the Instant Pot), you can drastically reduce the amount of time needed to caramelize the onions In this case, the caramelized onions are done in just 35 minutes when cooked on ‘manual > high’ in the Instant Pot. The high pressure helps break down the onion, while at the same time caramelizing the natural sugars. Since the lid is sealed, and no liquid can escape, you don’t have to worry about the onions burning in the pot. Making this Instant Pot French onion soup happens in two parts. First we need to caramelize the onions. For The Topping – Note: The French Onion Soup is easily kept gluten free and lactose free by using diet appropriate toppings! To reduce cooking time and make the best use of your time, multitask and pre-heat the Instant Pot while cutting the onions. Press the ‘saute’ button, and then ‘adjust’ to switch the heat to high. 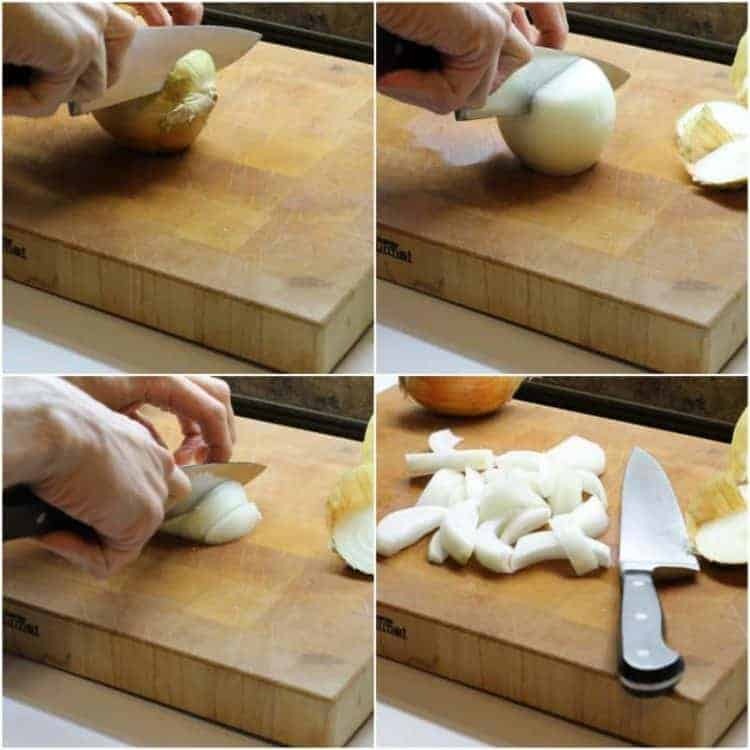 While the pot heats up, peel and cut the onions as shown in the picture below. Add the clarified butter, (or oil) to the hot Instant Pot and then add the rough cut onions. I use clarified butter instead of whole butter so that it does not burn when it hits the hot surface of the pot. Instead of using clarified butter you could also use oil. Saute the onions in the pot for ten minutes, just to coat the onions in the fat and get them to start releasing some liquid. Turn off the Instant Pot, add the chopped garlic cloves, bayleaf, and salt to the Instant Pot. Lock the lid in place, and set the pot to cook on ‘High’ (manual setting) for 30 minutes. After the Instant Pot beeps signaling the 30 minutes of pressure cooking are over, quick release the lid. Be careful not to burn yourself as the hot steam releases! If using a smaller size model of the Instant Pot the onions may have some liquid in them. Turn the pot to saute to cook of the water and brown the onions. Add the beef broth, red wine, remaining herbs, and pepper. Simmer on low for 10 minutes and then re-season with salt and pepper! Portion the French Onion Soup into individual oven safe bowls, top with the croustinis, cheese and then broil in the oven until melted and bubbly. About 3- 5 minutes. The Instant Pot French onion soup can either be served right away or easily be stored in the fridge for up to a week. 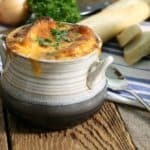 When ready to serve, heat the french onion soup in a pot (if it was in the fridge), and pour the soup into ceramic or heatproof stoneware bowls. Top the soup with some homemade croustinis, and then top with a generous handful of shredded cheese. Cheddar cheese will do just fine, but I would recommend using a cheese which has some sharpness to it such as Gruyere or aged Beemster. 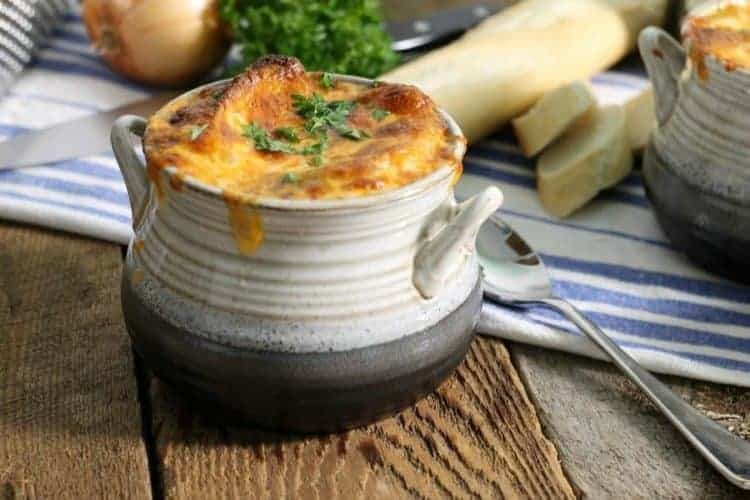 Place the filled bowl of French onion soup on a baking sheet (to catch spillage), and bake the soup in a 375F oven until the cheese is melted and slightly browned! A classic soup full of sweet caramelized onions, rich beef broth, and topped with cheesy goodness, making restaurant quality French onion soup couldn't be easier then with this Instant Pot recipe. Pre-heat the Instant Pot by pressing 'saute' and then 'adjust' to turn the heat to high. As the pot heats up, thickly julienne the onions, and chop the garlic. Sautee the julienne onions & chopped garlic in some clarified butter or oil in the hot Instant Pot for 10 minutes, just to slightly soften them. Add the bayleaf, and salt, to the pot. Close and latch the lid on the Instant Pot with the vent switch pointing to 'sealed'. Switch the program to 'manual' and set the time to 30 minutes. Once the onions have caramelized and the Instant Pot beeps, release the pressure using the instant release method. If the onions have a lot of liquid in them, use the saute function to cook of the liquid and brown the onions. This may occur if using a smaller size model of the Instant Pot. Add the remaining ingredients to the Instant Pot and switch the program to sautee. "Adjust' the heat to LOW. Simmer the French onion soup for 10 minutes. 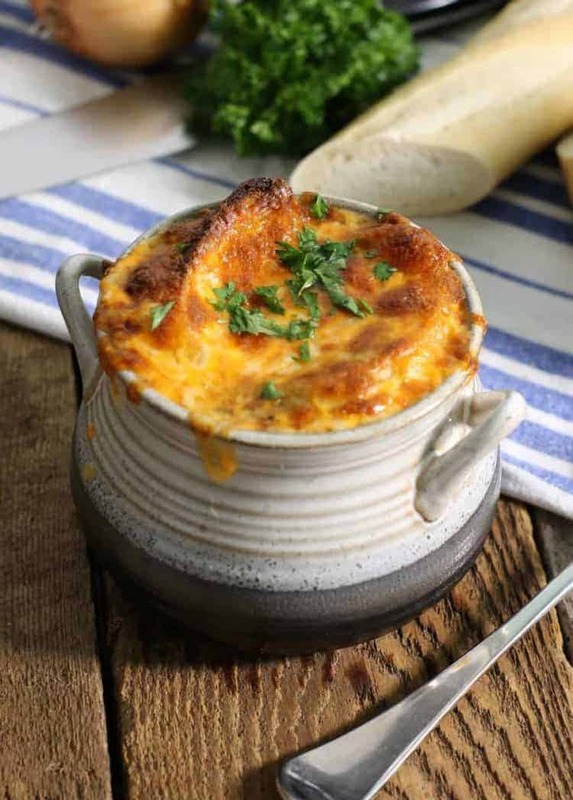 To serve pour the french onion soup into heat proof bowls, top with fresh cut baguette and shredded cheese. Bake in a 375F oven until the cheese is golden brown. Note: The French Onion Soup is easily kept gluten free and lactose free by using diet appropriate toppings! What a great idea to caramelize the onions that way but don’t you need to add a little water to the onions when cooking in the pressure cooker? French onion soup is my actual favorite. I will have it anytime, but especially love it on a cold winter day. Having fallen in love with my instant pot, I am always looking for new recipes to use it and this is definitely going on the list! I adore French onion soup! Fantastic! It’s a great recipe for the IP and makes cooking a batch so much easier! We are huge fans of French onion soup around here. I would have never thought to make it in the instant pot. You have convinced me to give it a try! 🙂 Your pics are making me drool. I love my Instant Pot—but only for certain recipes! Caramelizing onions in it is a brilliant idea! This recipe is drool-worthy! I made this today, but substituted vermouth because had no wine. Absolutely delicious! Best I ever had and my husband had two bowls of it. Thank you so much. Fantastic! I’m glad you both enjoyed it! Tag me on social media (@earthfoodandfire) I’d love to see pics of your soup! Can the wine be exchanged for water? It certainly can be Karen! Tue resulting broth just may not be as flavorful. You could also add a dash of vinegar to add a little acid to the broth and bring out the flavors. Not a lot though! Hi Lisa, You are right, the caramelization is what makes the Onion Soup so tasty! You can of course caramelize the onions the traditional way in a pot on the stove, though depending on how many onions you are caramelizing, this can take quite a while! The Instant Pot lets you caramelize the onions in just half an hour by cooking the onions at high temperature while under pressure. Cooking under pressure speeds up cooking times. If you prefer to cook the onions in a pot on the stove though, that works just as well with the remaining steps in this recipe!